Earth Balance is a company that claims to “take the health of our planet just as seriously as we take the wellness of our customers.” They also assert this position with a Non-GMO commitment believing in “environmental protection and agricultural methods that work in harmony with nature.” When we investigated Earth Balance, we found these statements to be purely superficial marketing tactics designed to deceive consumers into purchasing foods manufactured with ingredients which completely contradict their corporate philosophy statements. Many Kashi lovers were in disbelief after my report revealing the deceptive claims made by their breakfast products. As a Kellogg company, Kashi stays true their corporate masters and riddles their products with genetically modified (GM) and pesticide loaded ingredients. The reason more organic and natural brands are being exposed is twofold: First, many of them are being bought out by large multi-national corporate food giants who then adopt their own protocols, including diminished standards of quality and deceptive policy practices considered normal across the industry; and second, agricultural and labeling practices have become so lax and unregulated by the USDA and other organic certification agencies, that they are practically redundant in terms of any protection to the consumer. The largest food giants have one goal–profit. They couldn’t care less about the end consumer, their safety or the growing needs of a family, especially if that involves maintaining integrity through health conscious food choices. That’s why they produce the cheapest quality food on Earth with little nutritional value and maximum profit potential. Health conscious consumers became wise to their game long ago. So the food giants had to evolve to continue to increase profits and capture these segments of the population they had lost. As small organic brands proliferated, they were bought out by the big boys who had the money, resources and branding power to reformulate high quality products into inferior substandard duplicates. This has happened to hundreds of organic brands and so the cycle continues. There are now hundreds of trendy brands promoting a plant-based diet and earth-friendly lifestyle through their online portals and social communities. They attract raw foodies, vegans, vegetarians and just about anybody else who thrives on an alternative source to our troubled conventional food supply. These trendy umbrella affiliates have become very creative in how they reach out to the health conscious communities. Earth Balance is just one of them. Earth Balance is a division of GFA Brands, Inc., an operating affiliate and subsidiary of Smart Balance. So who are they? Smart Balance buttery spreads were first introduced in 1995 by GFA Brands. The company was previously known as Boulder Specialty Brands, Inc., and had its initial public offering in 2005. They changed their name to Smart Balance, Inc. in May 2007, when they acquired GFA Brands, Inc., a privately held company, which owned the Smart Balance and Earth Balance brands. Their products can be found in almost every mainstream supermarket chain in the U.S. and Canada, as well as many larger format stores. Earth Balance products are found primarily in natural food as well as a growing number of regular supermarkets. Smart Balance is already a fairly big player in their market niche. Their net sales are well over 300 million per year with well established profits and operating incomes that would impress any shareholder. But they didn’t get there by using the best ingredients and staying true to the people that bought into their market. They got there by using artful persuasion and malicious practices which deceive people into purchasing a message about food rather than a food that epitomizes the message. 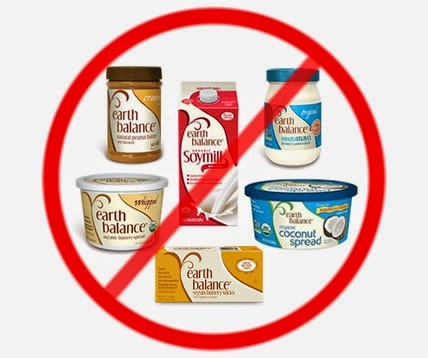 Before I dive further into the details of Earth Balance products, I would like to categorically state that even before investigating this company, I never ate or purchased any of their products. I’ve always considered their product line junk food. In my opinion, healthy food does not contain processed GMO oils and Soy and it never will. These are two of the ingredients commonly used in many Earth Balance food products. Neither are a health food and both can cause serious health problems in the long-term. For a brief analysis on the health dangers of soy, please review #2 on my recent article, 7 Foods To Stop Consuming Today. Soy is very problematic crop. Non-organic sources of soy in many agricultural practices are being passed off as organic. In 2011, the USDA uncovered a plot to import fraudulent organic certificates produced by an uncertified supplier in China. The Chinese firm used the counterfeit certificate to represent non-organic crops, including soybeans, millet and buckwheat, as certified organic. In July 2012 genetically modified sugar beets got a sweet pass from the USDA. The agency announced that the crop posed no pest risk and would therefore be deregulated, much to the disappointment of groups like the Center for Food Safety, Organic Seed Alliance, High Mowing Organic Seeds and the Sierra Club, that challenged the agency in a lawsuit stretching back to 2008, on the premise that not enough research had been done over the environmental impacts of the genetically engineered crop. Nearly 95 percent of the U.S. sugar beet production is grown from genetically modified seeds — a swift change from 2005 when they were first approved for planting. More than half of U.S. domestic sugar production comes from sugar beets, the remainder comes from sugar cane. At one point there was a nationwide ban imposed on GMO sugar beets and it was overturned the next business day. It is the jurisdiction of the US Department of Agriculture to determine whether plants are environmentally safe; this case is about whether the plants can cross pollinate (by wind, insects, etc) and contaminate other plants. However, the USDA never properly assigns itself a responsible enough position to investigate this task because it would cost Monsanto billions of dollars and we wouldn’t want that. Palm Fruit oil is taken from the fruit of the oil palm tree. It comes from the same part of the palm tree as regular palm oil. Palm Fruit Oil is simply another ingredient that needs to be banned from our food supply. We don’t need it if it’s not sustainable in the health of our ecosystems or wildlife. Fully chemically processed sap from the agave plant is known as hydrolyzed high fructose inulin syrup. It needs to be hydrolyzed so that the complex fructosans are “broken down” into fructose units or it won’t be sweet! Depending upon where the agave comes from and the amount of heat used to process it, your agave syrup can be anywhere from 55 percent to 90 percent fructose, whereas sugar and honey are closer to 50% fructose and 50% glucose. Fructose is much sweeter than glucose, and this chemical makeup also explains why the glycemic index is lower (it only takes glucose into account). A significant danger here is that fructose does not stimulate your insulin secretion, nor enhance leptin production, which is thought to be involved in appetite regulation. Soy in all of Earth Balance’s Soymilk does not follow the slow stringent fermentation process necessary to make soy non-toxic. Consequently the entire Soymilk product line is toxic by their primary ingredient. The entire Soymilk line also contains Carrageenan, which acts as an emulsifer and stabilizer. All Carrageenan is typically extracted using powerful alkaline solvents. Even at low doses, it has been found to destroy human cells and is linked to various human cancers and digestive disorders. Carrageenan has also been found to impair and depress cell-mediated immunity and cause the proliferation of tumour growth. The mechanism responsible for carrageenan-induced immune suppression is believed to be its selective degenerative effect on white blood cells. After reviewing all of the above, is this a company that takes the health of our planet just as serious as they do health and wellness? They do not protect the environment or source ingredients from agricultural methods that work in harmony with nature. They do not uphold their Non-GMO commitment and they continue to use toxic emulsifiers and sweeteners. Earth Balance should be ashamed of their misrepresentation and I urge you to help educate others by sharing this information with as many health conscious consumers as possible. The only way we will stimulate a call for action and bring a greater sense of integrity to the health food industry is by exposing companies like Smart Balance and their subsidiary Earth Balance.